Who could be top dog in the fight to acquire Zynga? Zynga-owned NaturalMotion is a sponsor at Pocket Gamer Connects London 2019, which takes place on January 21st to 22nd. Visit the PGC website for more details on the event. In surprise news last month, Bloomberg reported that mobile games developer Zynga has become an acquisition target of other developers. According to “people familiar with the matter”, preliminary approaches had been made, though there had not yet to be any formal discussions on a takeover. No company names were revealed by the sources. But who would want to buy Zynga and what would they be getting? Why Zynga and why now? First, we’ll take a look at what a company would be getting if they bought the San Francisco-based developer. For starters, any potential suitor would also be picking up NaturalMotion and Gram Games. The former, acquired for $527m back in 2014, develops the lucrative CSR Racing series of games, which includes the highly successful CSR Racing 2. The IP is reported to have represented 15 per cent of online game revenue (total $168m) in Q3 2018, according to company financials. The UK company also made the not-so successful Dawn of Titans and is known to be at work on other projects such as a new Star Wars mobile game. On top of that, NaturalMotion has its own technology in Euphoria and Morpheme, powerful animation tools that have been used for games across platforms, including notably in GTA IV. It should be noted that NaturalMotion closed its Oxford office in 2017 however and halted the licensing of its middleware to third-party developers. It’s not clear what the state of this technology is as of 2018. With Gram Games meanwhile, Zynga has bought a successful developer with offices in Turkey and the UK. While it previously developed hyper-casual titles - one of the hottest areas in mobile right now - Gram in fact has no more plans to develop such titles. Instead, it’s focusing on its recent big in-app purchase-driven hit Merge Dragons - a key reason for Zynga’s big $250 million deal for the company. CEO Frank Gibeau said it could become one of the firm’s “forever franchises”, the core IP that the developer is focused on across its studios. Other recent acquisitions by Zynga over recent years include the purchase of the Harpan Solitaire games for $42.5 million and Peak Games’ card games portfolio (which included Gin Rummy, Spades and Whist), for $100 million. It’s not all about acquisitions of course, Zynga has plenty of its own IP. The Words With Friends franchise, which now includes WWF 2, continues to be hugely popular and mobile revenue grew 42 per cent for the IP in Q3 2018 year-on-year. It’s also a key driver of the publisher’s advertising revenue, up 45 per cent year-on-year. On top of this, Zynga has well-known IP from its Facebook heyday such as FarmVille (which its Helsinki studio is now working on), CityVille (also in development for mobile) and Mafia Wars. It’s yet to replicate that kind of success for these titles on mobile to date, and even canned a new version of the latter during soft launch. Perhaps its biggest business is in its social casino titles. Zynga Poker is the standout, representing 20 per cent of online game revenue in Q3. The company’s slots titles, which include Wizard of Oz Slots and Hit it Rich! Slots, took 25 per cent of online game revenue. Right now, any suitor would be getting a company that’s half in the social casino market and half in the mobile games space. Zynga is also now handling some top licences with the potential to make money: including Harry Potter, Star Wars and Game of Thrones, not to mention the recently launched match-three Wonka’s World of Candy. Aside from its games, a buyer would be getting a company that, while based in expensive cities like San Francisco and London, owns its office in the former (which it bought for $228 million in 2012). To speculate, Zynga is also still likely sitting on hundreds of millions of dollars it has from its Facebook highs, despite years of company losses and recent expensive acquisitions. Recently Zynga has turned around its finances, finally turning a profit in recent quarters under the stewardship of Gibeau (it was previously led by founder Mark Pincus, former Xbox head Don Mattrick, and then Pincus again). With the company seemingly having course corrected and aggressively pushing areas of growth - now seems like a prime time for a buyer. It won’t come cheap though. Zynga currently has a market cap of over $3 billion and any takeover would likely add a premium on the share price to that. But if any suitor was interested in a large company with an increasingly lucrative mobile portfolio, now would be the time. With all that in mind, who then might be interested in such a mobile company? We’ve taken a look at some potential suitors who have been cropping up in industry discussion, as well as our own. The South Korean-based developer already has a successful mobile games portfolio. Its big hit is Lineage 2, which is estimated to have generated more than $1.3 billion in 20 months, with most of that coming from its home nation. Netmarble has previously invested as much as $130m in Cookie Jam and Harry Potter: Hogwarts Mystery developer Jam City (then called SGN) - giving it access to a lucrative casual portfolio and a growing midcore one. The US developer also recently signed a big deal with Disney to utilise its roster of popular licences. It also acquired various Kabam assets back in 2016, snapping up the Vancouver studio, the wildly successful Marvel Contest of Champions game and other assets such as its Austin and San Francisco teams. At that time, Netmarble launched an initial public offering, valuing it at around $12.2 billion. Despite having already made investments and acquisitions, the company clearly stated it was ready to move forward on more purchases with the money from its flotation. A move for Zynga would give it a stronger foothold in the Western market and add some lucrative titles to its global portfolio - on top of Jam City and Kabam. The key reason why the two companies could be a good fit is Zynga’s social casino titles. Netmarble previously failed in a $4.3 billion bid for social casino games giant Playtika back in 2016, losing out to a Chinese consortium. It has not made a move for another company in the space since. A deal for Zynga then would support Netmarble’s ambitions in the space, as well as providing other benefits. Whether shareholders will feel confident about a Zynga acquisition, however - a company with large expenses and coming off the back of years of losses - is another thing entirely. Publisher NetEase is one of China’s ‘big two’ in the mobile games industry, alongside Tencent. It’s had massive success in the country and the two firms typically dominate most of the top 10 grossing spots. NetEase’s portfolio includes battle royale hit Knives Out (particularly popular in Japan), Rules of Survival, Fantasy Westward Journey, Onmyoji and recent success God Night, amongst others. Over the last few years, NetEase has been ramping up its activity in the West as it looks to both expand globally and tap into lucrative Western IP. It invested $100 million into Destiny developer Bungie in June 2018, which could set that company up for a mobile push. Meanwhile it invested $50 million into London start-up Improbable, whose technology is being used to power huge persistent virtual worlds that can hold a large number of players at one. It’s also been working Icelandic developer CCP to develop a mobile title for Chinese users based of its hit MMO IP Eve Online. Since that announcement, CCP was acquired by another South Korean company, Pearl Abyss. Then there’s the recent controversial announcement of the Diablo Immortal mobile game, which Blizzard is collaborating with NetEase on. A move for Zynga would give NetEase a much stronger foothold in the West than it has currently, providing it with a local partner that could help it expand its IP more globally, and vice-versa. It would also come at a time when China continues its freeze on new games licences which is blocking fresh releases, unlocking a revenue stream not bound by ever-changing Chinese regulations. A turn-off for any deal though could be the high price, while it’s not clear if NetEase has any ambitions for social casino. 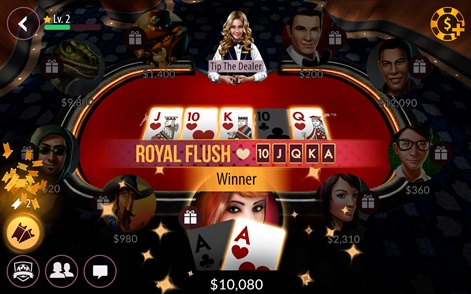 Such a deal would certainly raise eyebrows from the wrong people at home, with the Chinese government cracking down on casino titles in China and becoming increasingly hostile to the mobile games industry at large. This deal seems unlikely but is worth a mention. Tencent of course has bought and invested in numerous games companies around the world, and continues to do so. Its key acquisition was Clash of Clans and Clash Royale developer Supercell for some $8.6 billion back in 2016. Tencent also owns Miniclip and has stakes in Pocket Gems, Epic Games, Activision Blizzard and Glu Mobile, to name a few. Given it has already has such an influence over the global games market, and most importantly has the very profitable Supercell in its portfolio, Zynga doesn’t appear to offer Tencent anything it doesn’t already have. Tencent could probably put the funds together (though shareholders appear increasingly uncertain of its M&A strategy), but such low short-term returns might prove unattractive. And much like with NetEase, the issue of its social casino portfolio could be the nail in the coffin for any interest. The US publisher’s name has cropped up through industry discourse and it’s been mentioned in subsequent Bloomberg reports after the site initially broke the news of potential takeover interest. EA is unlike its big PC and console publishing rivals. Activision Blizzard bought its way into mobile with the $5.9 billion purchase of Candy Crush Saga developer King in 2015, while Take-Two acquired Barcelona studio Social Point for $250m in early 2017 and Ubisoft swooped for serial games publisher Ketchapp in 2016 for an undisclosed fee. Instead, EA has quietly built up its mobile portfolio over time (aside from that small $680m acquisition of JAMDAT in 2005) from licences and its own roster of IP, and to some great success - it’s a half a billion dollar-plus annual business for the publisher. Top titles include flagship Star Wars: Galaxy of Heroes (by Capital Games), FIFA Mobile and Madden Mobile. It also recently released The Sims Mobile, which as yet has not lived up to expectations. Sensor Tower reports it made more than $20 million from March to the end of September 2018. For some more perspective, it still lags behind The Sims FreePlay in the US App Store top grossing chart, according to App Annie. Though the gap has closed. But it’s possible that EA could look to rapidly scale up this business with the acquisition of Zynga, which could further help further unlock its IP on mobile and find that next hit that EA needs to grow its mobile business. And don’t forget, Zynga is now headed up by former executive VP of EA Mobile Frank Gibeau, giving the company some close ties. (As a side note, over the years Zynga has been a revolving door for former EA execs). Once again, the price may be too high, however, particularly given EA won’t be getting a Candy Crush Saga-sized success and returns aren't currently significant enough for quickly recouping the cost. But at this point in the market, as it continues to consolidate, now may be as good a time as any to buy a developer that’s getting back into growth again. Another name out of Bloomberg, Ubisoft has already made moves into mobile with various acquisitions over the years. Its acquired studios include Hungry Shark developer Future Games of London, Growtopia, narrative-focused outfit 1492 Studio and most notably hyper-casual publisher Ketchapp. It previously had a connection with mobile games publisher Gameloft, with one of the Guillemot brothers, Michel, founding that company. It was since bought by Vivendi, however, in a 2016. Following that, Ubisoft fought hard to avoid its own Vivendi takeover, and won. It’s clear the French publisher wants to expand its mobile operations, but its previous deals do not suggest a company ready to splash billions of dollars on Zynga. An acquisition could potentially work though. It would give Ubisoft a clearer stake in the mobile market, with a large company that could utilise its various powerhouse IPs such as the Tom Clancy games, Rabbids, Far Cry and Assassin’s Creed in the space. While Ketchapp was a key deal for the publisher, it does not focus on long-term IAP-driven experiences. Ubisoft's franchise focus would also fit in with Zynga’s own 'forever franchise' direction it's been pulling in over the last few years. Perhaps Ubisoft has decided that it’s high-time it made a bigger push into mobile, and a deal for Zynga would be a huge statement to that end. It's a move its new stakeholder Tencent would no doubt also support.